A not-so-serious look at the history of the Eurasian Watermilfoil Program as recalled by Greg Armour, Program Manager 1976-2007. I was introduced to Eurasian watermilfoil in January of 1976 when I accepted a position with the Okanagan Basin Water Board. Fresh out of University, I hoped to gain six months to a year of valuable experience to further my career goals. With 31 years behind me, my career goal now is retirement. 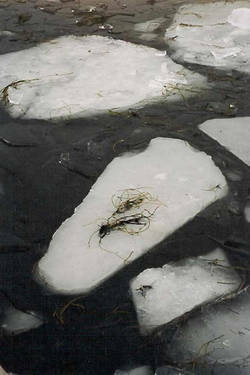 In 1976, the Department of Lands, Forests, and Water Resources – soon to become the Ministry of Environment, then the Ministry of Environment, Lands, and Parks, followed by the Ministry of Water, Land, and Air Protection, and then – yes, the Ministry of Environment once again – partnered in a Eurasian watermilfoil control program jointly funded with the Okanagan Basin Water Board. $50,000 from each participant seemed like a lot in 1976! The destructive effect on beaches of the Okanagan by this foreign plant, indeed it was known as ‘the alien invader,’ was big news – Eurasian watermilfoil made the media agenda almost everyday. Where did it come from? How could we get rid of it? Who was going to pay to get rid of it? Could it be smoked? There had been some earlier weed control trials, from 1972 to 1974, using a Mudcat dredge, a weed harvester, and the herbicide diquat. The program goal at that time was to rid the lake of the weed entirely – eradicate it – and the results of the trials were not satisfactory. While the dredge removed weed roots, albeit at a snail’s pace, it spewed dark malodorous lake bottom sediment into a settling pond constructed at a distance from the lake. It seemed no one enjoyed having this ‘pond’ in their neighbourhood. The herbicide killed only plant top growth and when applicators noted the deadly toxicity on the chemical’s label, diquat was not used again. The harvester left a better groomed version of the problem but did not have any long lasting end result. Development of root removal methods seemed worthy of more effort. Back to 1976 when we devised a floating barge supporting a large pump that powered high pressure water jets. The intention was to dislodge watermilfoil roots from the lake bottom but every so often the device would become stuck and create a hole in the sediment several feet deep. This work was being done in January and, of course, to get out in the lake to the machine we used the latest high tech transport – chest waders. The holes left by the water jet were easily located by the screams of the crew members. Water jetting was not satisfactory in removing plant roots so we looked for an alternative. We built the first rototiller – a converted weed harvester with two gas engines, and no cab to protect the operator in winter conditions and controls that belonged on something from the Flintstones. We had no idea how to operate it – it was one of a kind – driven by the rototiller’s response to lake bottom contours. We made serpentine like paths through the weed beds which much to our horror showed up in great detail in any aerial photograph. We constructed containment ‘booms’ to collect the uprooted weeds and prevent spread of the fragments. With every windstorm these were found in a tangled mess near shore. We later dispensed with the containment booms since cold water conditions in the winter reduce the risk of reinfestation. Based on the promising results of our experiments, the Ministry of Environment stepped in to administer and fund the program in 1977, deciding that the eradication effort had potential and warranted a budget increase from $100K to $2 million. We used a range of methods in an effort to control the plant and stop its spread to other Okanagan lakes and to areas beyond the Valley. We constructed screens at several points in the Okanagan River Channel to try to keep milfoil fragments from drifting downstream. These barriers had to be cleaned regularly not only to remove milfoil fragments but all manner of distasteful debris ranging from trees to deceased livestock. 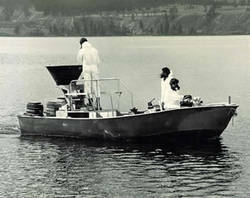 From 1979 to approximately 1981, we set up boat and trailer check points at a number of locations entering the Okanagan where motorists taking boats from the Okanagan to other lakes were asked to pull over and have staff make sure the plant was not going to be introduced into another lake. Most travelers were very courteous . . . and some were not. The Ministry initiated an experimental chemical control program using the herbicide 2,4-D. It is an understatement to say that this was not well received by a significant portion of the Okanagan public. I recall one resident saying that if this was an experiment he wanted to be in the control group where subjects were not treated! The sight of herbicide applicators resembling staff from the Disease Control Centre did nothing to reassure the skeptics. It is true though that many of the applicator staff remain alive and relatively disease free today. Results were varied but opposition to using chemicals in the lakes, the difficulty in supplying alternate sources of drinking water, and the need to treat annually or every second season, won the day. The program was dropped, and I began to sleep through the night. 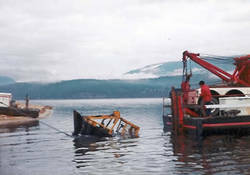 Diver operated dredges were used to remove small patches of milfoil. 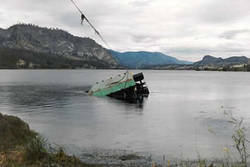 At one point the program seemed to employ almost all the certified divers in the Okanagan. A team of divers, each armed with a four inch suction hose would vacuum the lake bottom in shifts of four hours each. Eurasian watermilfoil roots were sucked up and discharged into a mesh basket on the dredge platform. Sediments passed through. Occasionally the divers unearthed an unpleasant surprise such as an unexploded WWII mortar shell. A team of demolition experts was dispatched from Ottawa to deal with the explosive situation and after extensive consultations, meetings, research, all taking place at the National Hotel, the shell was thrown back in the lake… well no… it was safely detonated. The incident, however, did inspire one dive crew member to buy a shell casing at Surplus Herbie’s and toss it onto the dredge deck during his underwater shift. Crewmates were tolerant of his humour and he was released from hospital with only minor contusions. At the same time it seemed the entire world had become inventors. People came forward with a myriad of milfoil removal contraptions each of which was evaluated by Provincial staff. Milfoil-infested test areas were set up for performance trials of some pretty wild devices. There were no winners as far as producing an effective milfoil control machine but the Ministry did sponsor a machine design contest with a $10,000 prize. The winner was a fearsome device named ‘Aquanautus Billygoatus.’ It was never built. Another Kelowna inventor toiled for three years in utmost secrecy to produce the ultimate weed eradication machine. He insisted that a specific lake area be his test plot and the site was set aside for three years for evaluation of the machine. The device never hit the lake. On the other end of the spectrum, one inventor decided to produce a smaller version of our rototiller machines for home use. He used a conventional garden machine and mounted the engine on a platform three feet above the tiller in order to have it remain clear of the water while the blades did their job. The stability of the device was a concern and of course the contraption fell over. So much for one rototiller. 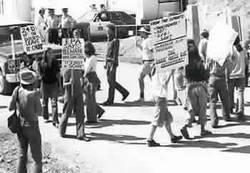 In 1981 the Ministry of… whatever they called it then… relinquished operation of the Eurasian watermilfoil control program to the Okanagan Basin Water Board. 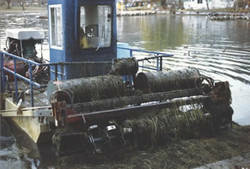 The goal of the program shifted from the impossible task of eradicating Eurasian watermilfoil- to the nearly impossible task of providing effective control of the plant. Harvesting remained the primary method of control but the promise of achieving longer term and higher quality effectiveness from rototilling led to further trials. We learned that an operator’s cab on the machine reduced staff turnover and the incidence of hypothermia. The extended operating season afforded by rototilling during the winter months combined with summer harvesting allowed more infested area to be treated. It was, however, necessary to discern when rototilling should cease as plant growth had begun in the spring. Mechanical removal methods were not without their pitfalls. A minor public inconvenience was created when the rototiller severed the main (then) BC Tel. cable at Hot Sands Beach in Kelowna, thereby depriving the Westside of phone service for a number of days. Fortunately, this incident happened in pre-internet times so young people were not deprived of MSN chat. Harvester operators were encouraged to maximize the size of loads of cut weeds to speed up operations, but efficiency has its limits. We adapted a tracked muskeg skidder to uproot Eurasian watermilfoil roots in shallow water. 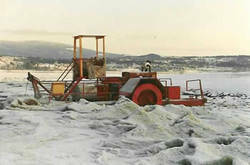 The Program Manager was reminded that the maximum operational range was up to 1.0 metre of water depth and that operators should be advised that, unlike the rototillers and harvesters, this machine does not float. A World War II amphibious landing craft (Army DUKW a.k.a. Le DUCK) was acquired to maintain the cutting edge technology of the Water Board program. Like the other derooting equipment, this device was fitted with an agricultural implement to remove plant roots. Unlike the Muskeg skidder, the DUCK floated. It provided entertainment for vehicles following along the road as the machine would make a left into the lake. Rarely did a car or truck follow. Neither operator nor aquatic life was seriously injured in this incident. Despite early efforts that were seemingly to the contrary, over the past 25 years the Okanagan Basin Water Board’s mechanical weed control program has evolved into a professional and effective operation. 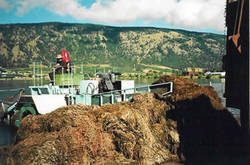 At this writing, three fulltime operators – running rototillers in the winter and harvesters in the summer – provide nuisance weed control throughout an extensive area of the Okanagan Valley lakes. We continue to make improvements to the design of the equipment and the operation program, especially where we can reduce the time spent fixing rototiller parts out on the lakes in winter. Without some kind of plant disease epidemic, outbreak of Eurasian watermilfoil weevils, or the discovery of a cancer-fighting wonder-drug found only in milfoil (causing it to be harvested to extinction), Eurasian watermilfoil will likely be with us here in the Okanagan for the foreseeable future. Our goal is to continue to control these weeds to acceptable levels in high-value public areas while protecting aquatic habitats and maintaining a cost-effective program. We recently received a huge compliment when a local newspaper editor, who’d been in the Okanagan for five years, said he’d never even heard of Eurasian watermilfoil. When your work has never been heard of, that is real success.